Most skunk owners will tell you that skunks are wonderful pets and are very intelligent. Of course, this is partly because pet skunks are "disarmed," usually having their musk or scent glands removed surgically at an early age, so they can't spray you. But, as with any exotic pet, appropriate expectations are vital to the enjoyment of having a skunk as a pet. Some of a skunk's personality traits, such as being stubborn and headstrong, can make it a challenge to live with. They are not low-maintenance pets. Fortunately, pet skunks are also friendly, loving, very entertaining, and playful. They are active, curious, and will get into everything. If items go missing, your skunk may have stolen them to make its bed softer. Skunks don't tolerate being housed in a cage for extended periods of time. They need a skunk-proof play area and lots of stimulation. As they are natural diggers, you will have to expect scratches on your woodwork from your skunk's sharp claws and teeth. Spaying and neutering are needed because the skunk is an induced ovulator. 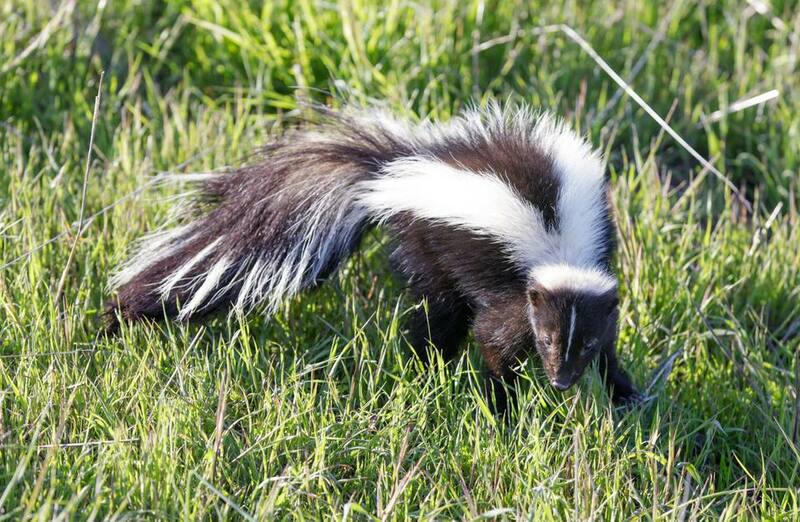 This means that the male and female skunk are very aggressive with each other in order to make the female fertile. This can result in injuries to the skunk as well as to humans. It is best to keep a pet skunk indoors as it won't have its spraying defense against predators. Indoors, provide a large dog kennel for your skunk—as big as you can find. While your skunk will want to be out roaming about the house, it needs that safe place. When you are away from home, you can confine it in the kennel to keep it (and your house) safe. Outdoors, provide a pen that is at least 6 feet long, 6 feet wide, and 3 feet tall, with a nest box attached. Your home will need to be escape-proof to keep your skunk safe and contained. If your skunk is able to get loose, it can cover miles in a day and it will lack any homing instinct. Once your skunk is gone, it won't find its way back. If you want to take your skunk out of the house, it is a good idea to harness train it from an early age. Skunks can be potty trained with persistence using litter or papers, but it can be quite a challenge to do initially. In the wild, skunks are omnivores, eating anything they can find. As pets, young kits should be fed several times a day, while adult skunks can be fed in the morning and evening. There are a few pre-packaged, formulated diets available for skunks, but you are far more likely to find sources for them online rather than at your local pet store. Do not give your skunk any cat food as it is too high in fat and protein content for their health. If you aren't using a pre-packaged skunk food, your skunk's diet should be 60 to 70 percent lean protein such as cooked chicken, eggs, fish, or feeder insects. The bulk of the rest of the diet should be fresh, cooked, or thawed frozen vegetables. Avoid canned vegetables due to the salt content. Nuts, cooked grains, a few pieces of dog food, and yogurt should also be mixed into the diet. Fruit can be given as a treat, but not every day. Try to offer your skunk foods high in calcium and taurine or give it supplements that can provide these. Chocolate must be avoided as it is dangerous for skunks. Skunks need access to fresh water at all times, but they don't drink very much of it. They get much of the water they need from the vegetables in their diets. Skunks should be spayed or neutered at a young age, usually when 4 to 6 months old. Descenting may be done at the same time, although it is often done at an even younger age while the kits are still with the breeder. Be aware that it is difficult to find a veterinarian who will descent a skunk and you may have to travel to get it done. Skunks need to be vaccinated against common dog and cat diseases, including distemper, and dewormed. Before getting a skunk, find a veterinarian who is willing to comfortably treat one as a patient in case your pet requires medical attention. There are a lot of misconceptions about skunks and rabies. Although skunks are relatively common carriers of rabies in the wild in some areas, it is a myth that all skunks carry rabies. They need to be exposed to a rabid animal to become infected themselves. However, there is no approved rabies vaccine for skunks, so if a skunk bites someone and it is reported, authorities will inevitably require rabies testing on the skunk. Unfortunately, this means the skunk will be euthanized to look for rabies. The same is true for many other species for which no accepted vaccine exists. Some veterinarians vaccinate skunks with an unapproved vaccine meant for ferrets, dogs, and cats. But authorities will not recognize this vaccine as coverage against rabies and it is unknown whether or not it will protect your skunk from infection. Is It Legal to Own a Pet Skunk? Skunks are illegal to keep as pets in some areas so check with your local authorities to see if you can keep one in your home. If they are illegal where you live, don't flout the law. The first time anyone complains about your pet it may be confiscated or euthanized. You should never take a skunk from the wild to keep as a pet. State laws vary and some places will consider a skunk native wildlife while others consider them to be an exotic animal. Permits, special insurance, or other requirements may be needed in order to legally obtain and care for a pet skunk where you live. Make sure you do your research as laws and requirements change. You will need to find a reputable breeder in order to purchase a skunk. The peak availability is in the spring and you may have to place a deposit and be put on a waiting list. Be aware that the price can be several hundred dollars, which may cover descenting and spaying or neutering. There are some skunk rescue organizations that may have adults to adopt.